On the run yet again, Baron Frankenstein, with his assistant Hans, returns to his castle, only to find it derelict and all his belongings confiscated by the Burgomaster. Then, by chance, a beggar girl leads him to a cave in the mountains where he finds his creature, perfectly preserved in the ice. He manages to revive it, but needs the services of hypnotist Zoltan to reactivate the brain. Unfortunately, however, the creature will now only react to Zoltan’s voice and he plans to use it for his own greedy and vengeful ends! Freddie Francis’s other films as director for Hammer are “Paranoiac” (1963), “Nightmare” (1963), “Hysteria” (1964) and “Dracula has Risen from the Grave” (1968). For Hammer rivals Amicus, he directed “Dr Terror’s House of Horrors” (1965), “The Skull” (1965), “The Psychopath” (1966), “The Deadly Bees” (1966), “Torture Garden” (1967), “They Came from beyond Space” (1967) and “Tales from the Crypt” (1972). For his son Kevin’s Tyburn Films, he directed “The Ghoul” (1974) and “Legend of the Werewolf” (1975). 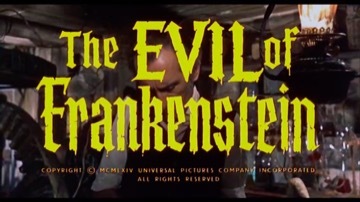 His other credits as director include “Trog” (1970), “The Creeping Flesh” and “Tales that Witness Madness” (both 1973). He also worked for Hammer as director of photography on “Never Take Sweets from a Stranger” (1960). Sandor Eles also appeared in Hammer’s “Countess Dracula” (1970). New Zealander wrestler Kiwi Kingston can be seen without his monster make-up in a fleeting role in Hammer’s “Hysteria” (1964). Philip Martell takes over the musical reins following the death of John Hollingsworth, remaining as Hammer’s chief Musical Director right up until their last film to date, “The Lady Vanishes” (1979).